Sassy Cassie, written and illustrated by PLA Schneider, is two stories for the price of one. Cassie is an imaginative and creative little girl who loves to colour her world. 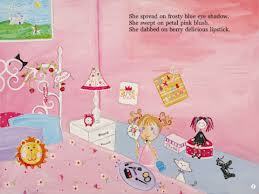 Despite having all the toys a child could wish, Cassie favourite toy is her mother’s makeup. Cassie loves to use her and her friends’ faces as a canvas. (I’m sure I’m not the only mother who can relate to this scenario!) Her increasingly exasperated mother manages to extract a series of promises from Cassie about not using her makeup, although it seems Cassie is an expert in finding loopholes in promises and rules, not unlike a child dear to my own heart. Katie eventually manages to find another interesting way to express herself creatively. 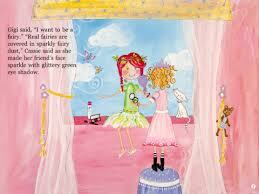 At the end of the story, Sassy Cassie receives her very own art equipment in Color Mixing with Cassie. She experiments with blending primary colours to make secondary colours, and plays with black and white to make shades and tints in her search for the perfect pink. While I’ve seen apps that explore primary and secondary colours, I’ve never seen one that looks at shades and tints. It would be useful to read this part of the story before art activities, and then have children see which colours they can make. But wait: there’s more! In addition to a great story and an art lesson, the Color Fun Quiz section rounds off the app with a series of comprehension questions. The question is written and narrated. Tapping the Answer button will reveal the answer. Easy navigation – swipe pages to move through the story. You can also swipe backwards to hear a page’s narration again. Text is highlighted as spoken. This feature is supportive of emergent readers who are reading along with the narration. This feature is only available in the main part of the story, but not available in the Clor Mixing or Quiz sections. Art lesson about mixing colours. Cassie narrates as she experiments with colours, mixing primary colours, white and black to make secondary colours, tints and shades. It would be useful for children to hear words spoken aloud as they are tapped. I’d also love to see the highlighting of words as they are spoken extended to the second part of the story. Children with a hearing impairment, or those reading the story in noisy environments, may have difficulty hearing the answers in the Fun Color Quiz, so it would be great to see the answers also available in text and/or illustration. Sassy Cassie is a delightful app that gives you a funny story as well as a lesson in art. Children will be amused by Cassie’s antics and inspired by her creativity. Parents will be amazed by how Cassie’s mother manages to keep her composure when facing “trying” times with her precocious daughter. An enjoyable and educational reading experience for all. Sassy Cassie is not just another pink, girly princess book…because this bold little girl has got some sass! Sassy Cassie is spunky and creative and nothing is going to stop her from making her mark on the world. Her surprise artistic creation at the end of the book is exasperating…but also lovable.